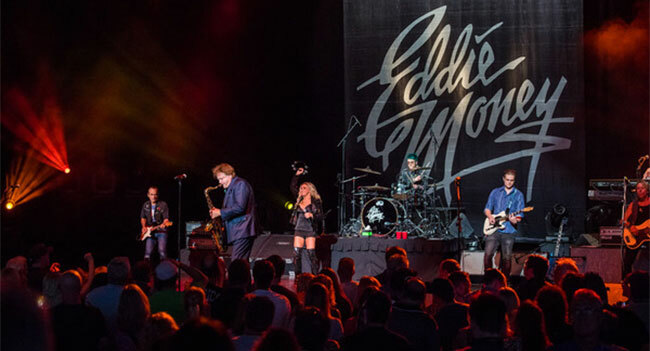 AXS TV is prepping an Eddie Money and Sammy Hagar marathon weekend in support of both stars’ returning series later this month. First, the network presents Money in his first concert special for the network, Eddie Money: The Real Money Concert, premiering Sunday, April 28th at 9 pm ET. The evening sets the stage for the season two premiere of the network’s popular reality series Real Money — a fun and heartfelt look at the Money family’s life at home and on the road — on Sunday, May 5th at 8:30 pm ET. Filmed at the DTE Energy Music Theatre in Michigan, the unforgettable night captures Money as he opens up the venue’s summer concert series for the 27th consecutive year — a beloved tradition that the showman and his fans look forward to each season. Rocking the packed house as only he can, Money puts his trademark humor on full display telling jokes and sharing anecdotes with the crowd, while blazing through a lively set of his most enduring hits, joined onstage by his children and fellow Real Money stars Jesse Money on backing vocals, and sons Dez Money and Julian Money on rhythm guitar and drums, respectively. Highlights include Money performing his newest single, “It’s A Brand New Day,” and Dez performing his original song, “Tonight,” as well as fan-favorites such as “Baby Hold On To Me,” “Walk On Water,” “I Wanna Go Back,” “Think I’m In Love,” “Two Tickets To Paradise,” and “Shakin’,” among others. Additionally, AXS TV puts the spotlight on some of the best moments from Real Money and Rock & Roll Road Trip With Sammy Hagar in the Real Money – Rock & Roll Road Trip – Binge-A-Thon on Saturday, April 27th, as the network counts down to the new season premieres on May 5th. The Binge-A-Thon opens with eight episodes of Real Money at 1 pm ET, followed by eight episodes of Rock & Roll Road Trip at 5 pm ET. The block is hosted by Jesse Money and Andrew Hagar who will be on hand to introduce their favorite episodes from their fathers’ series — providing unique insight into the proceedings and explaining why these episodes mean so much to them. The night concludes with Red ‘Til I’m Dead: Sammy Hagar’s Rock-N-Roll Birthday Bash at 9 pm ET, a star-studded concert that finds The Red Rocker ringing in his 70th birthday with a slate of performances from friends and fellow icons such as Eddie Money, Toby Keith, Darryl McDaniels, Bob Weir, and many more. Hosted by multi-talented musician Sammy Hagar, Rock & Roll Road Trip takes viewers out on the road and across the country, as The Red Rocker talks and rocks with some of the biggest names in music. The upcoming season puts the spotlight on 12 all-new episodes, kicking off with a powerhouse premiere featuring a trip to The World’s Largest Honky Tonk — Billy Bob’s in Fort Worth, TX — where Hagar takes in some local bull-riding action, before joining country icon Willie Nelson for a spirited conversation and an unforgettable impromptu jam session. Rock & Roll Road Trip With Sammy Hagar airs every Sunday at 8 pm ET/5 ,m PT, only on AXS TV. Real Money follows the daily lives of the Money family — which includes Eddie; Laurie, his wife of over 30 years; their five kids, Zach, Joe, Jesse, Dez, and Julian; and ten pets — as they live, laugh, bicker, and rock under one roof. Season two finds them attending a Money family reunion with Eddie’s brothers and sisters in New York; hitting the lanes for a day of bowling; taking a family trip to South Dakota with the in-laws; and welcoming Great Dane puppy Bette to their growing pack of dogs. Real Money airs every Sunday at 8:30 pm ET/5:30 pm PT, only on AXS TV.